Ride back in time and explore a state treasure – the President Calvin Coolidge State Historic Site. 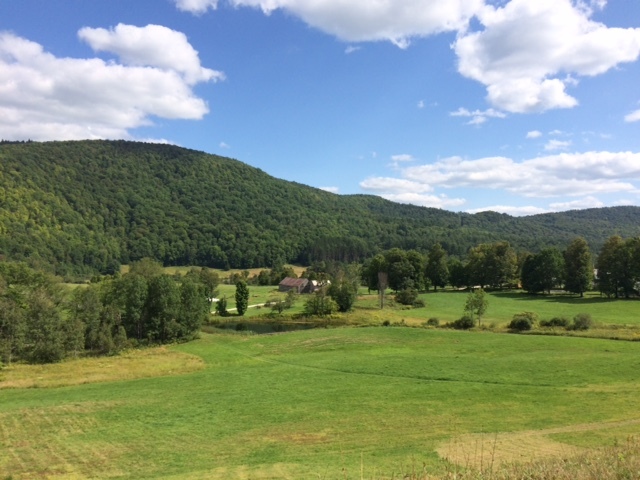 This small village, the birthplace of President Calvin Coolidge, has been restored and preserved in time to reflect life in a small farming village in rural Vermont. The small town of Plymouth Notch is beautiful from every angle and it is fun to explore the historic buildings. We will meet at the village Visitor’s Center, enjoy a 6-7 mile trail ride up through the hills and through the village, passing many historic sites. Then we will enjoy a soup and sandwich lunch at the Wilder House Cafe in the village. Afterwards, anyone who would like to explore the other buildings can do so at a discounted rate. 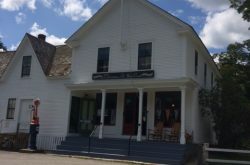 See the place where the president was born, the restored general store, a fun collection of horse drawn vehicles and sample cheese in the Plymouth Cheese Factory. There is a lot to see and do in this bucolic setting. We will meet in the parking lot for the Coolidge Museum and Education Center at 10am. To find directions, use 3780 Route 100A, Plymouth Notch, Vermont. The trail goes through and around the village. Go back in time and enjoy a restored village on horseback! The Woodstock-Reading mail delivery carriage is one of the many interesting historic carriages in the collection. Views abound from every direction. The home of the Coolidge family is restored to the time of his presidency. See the living room where Coolidge’s father oversaw his oath of office in the middle of the night. 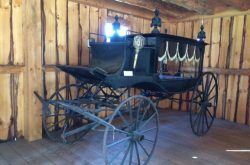 A horse drawn hearse – of course! There’s also a funeral sleigh for the other 6 months of the year. The General Store is a step back in time and offers many handmade items for sale. Above the store, you can see the “Summer White House” where President Coolidge conducted meetings while on holiday in his home town. 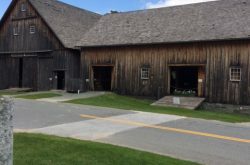 The Carriage Barn contains many wonderful horse-drawn vehicles and examples of early farm equipment and machinery.